This is the first step after clicking the Create Portable Installation button in the welcome screen. This button only appears if the application supports being installed in a portable manner. Portable installations do not require administrator privileges. 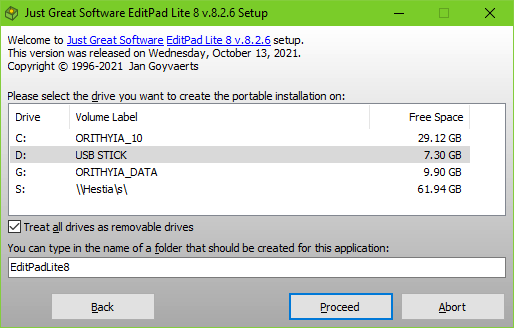 Thus the Create Portable Installation button does not show a shield icon on Windows Vista and later and will not result in a black screen security prompt. The setup program will show a list of all the devices on your computer that report themselves as removable, such as flash memory card readers, USB memory sticks, etc. Some devices that are physically removable may not be in this list. E.g. USB hard disks usually report themselves as hard disks rather than as removable devices, even though you can unplug them. A checkbox "treat all drives as removable drives" will be visible if that option was enabled on the Portable page while building the installer. When ticked, the setup program will show all drives on the user's computer, including internal hard disks and mapped network drives. The user can also type in the name of a folder that should be created for the application being installed. The setup program will copy all files into that folder, and perhaps create subfolders under that folder. No files will be installed anywhere else. If no folder is specified, the files will be copied into the root of the selected drive. If the application has optional components, component selection is next. If not, the setup immediately proceeds to the license agreement. The file associations screen is not used for portable installs, because they never create any file associations.